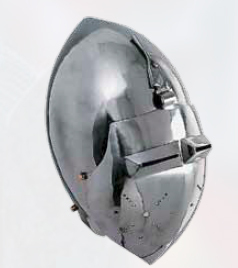 Hundred years war; Between c. 1390 and 1410 the bascinet had an exaggeratedly tall profile, it was an acutely pointed form — some so severe as to have a near-vertical back. Ten years later both the skull of the helmet and the hinged visor started to become less angular and more rounded. Almost globular forms became common by c. 1450. As part of the same process the helmet became more close-fitting, and narrowed to follow the contours of the neck. This page was last modified on 1 November 2013, at 18:41.